Michael Pena, formerly a division manager at the U.S. Energy Department‘s Brookhaven National Laboratory, has joined Apprio as executive vice president of the Washington-based technology firm’s homeland security business. 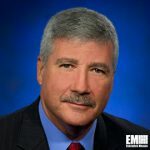 He comes into the role with 35 years of security and emergency management experience and will lead the organization that provides support work to the Department of Homeland Security, U.S. Coast Guard and National Disaster Medical System, Apprio said Tuesday. At BNL, he oversaw infrastructure and classified program security, preparedness and response, training, program development, audit and evaluation activities within the laboratory protection division. Pena has also worked at the Federal Emergency Management Agency, where he directed government response to natural disasters and terrorism events in region 2. He joined FEMA in 2002 as an operations chief and lead planner and later served as a regional emergency coordinator for the U.S. General Services Administration. His two-decade career at the New York City Fire Department included 16 years of service as a firefighter and an officer in FDNY’s special operations command. He holds instructor certifications in the emergency planning and response, terrorism, weapons of mass destruction and technical rescue areas.